yo creo que ella no se preocupa porque sabe, (y yo, también) que esos son amores imposibles. Una de esas mujeres es Sheila Chandra, de quien yo tomé sus ojos y su boca para hacer esta ilustración. I think she does not care because she knows (and me too) that these are impossible loves. One of those women is Sheila Chandra, whom I took her eyes and her mouth to draw this illustration. 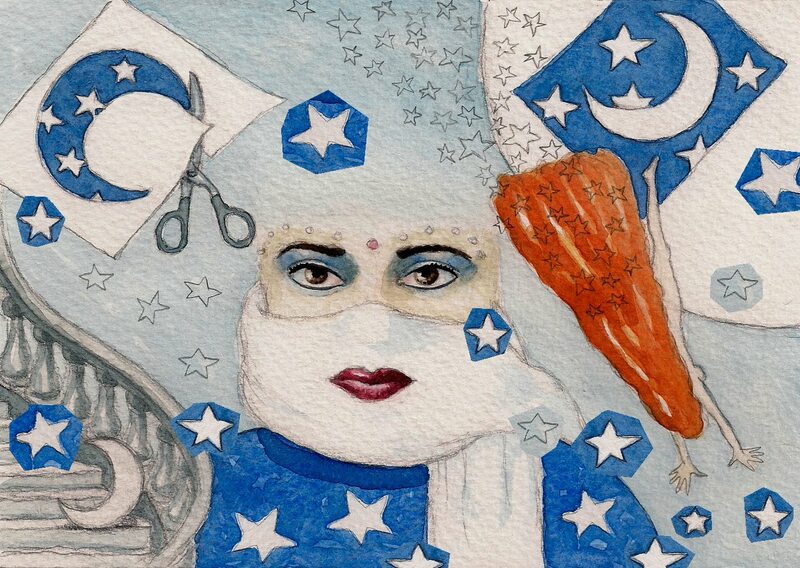 Sheila Chandra, hmmm, I have to google her... Great fresh illustration! Love the airy feel of it! Mi gusta muchisimo (la Mujer tambien! )...Como Sasa he buscado en Google La Sheila para imagenes...y lo que he encontrado? ?.....Este mismo dibujo tuyo...ya esta ayi...y mejor la mujer ya lo sabe eres enamorado con ella...Imaginarte si llegara a tu casa!!!! Los hombres siempre gustan un montón de mujeres igual que tu....yo tambien!!! oh you are such a romantic soul Roberto! Madame is so lucky to be loved by you!!!!! me encantan los ojos y la luna de estrellas. But we love really the person next to us, whom we see day and night, whom we can touch and talk to, kiss and hug, laugh and cry with, and even quarrel with... Your wife is surely happy by this sweet confession in love! What about Sheila Chandra - I haven't heard of her, but I suppose that you like her not only because of her beauty, but also because of her music. I'll search in Internet for her songs to listen. ¡Vos sos un poeta de la imagen y tu esposa lo sabe! Oh yeah, I used to listen to Sheila Chandra, was that in the '80s or 90s? Loved her music. I had forgotten her. I just noticed that we both did illos featuring women with scarves - unbeknownst to each other! I always enjoy how you weave narratives & surrealism into your work! She's a beauty...and so is the illustration! the stairs, the cut out moons and stars and the flying long-haired woman, they surround these eyes in a lovely way.